Since your posting on The Nice Niche, what have you been working on? Since my post on The Nice Niche I have been working on a group of new paintings that will be shown at the Citigroup Center in Manhattan this March. It’s a continuation from my last show at Estia’s and will feature some of the same paintings. I’m hoping to show a series of portraits that evoke a sense of curiosity from the viewer. All of my paintings feature a non-descript background and a lack of eye contact from the model. My work represents the impact of technology and our generation’s inability to disconnect and live in the moment. Some paintings embody our addiction to our mobile devices, and others represent what happens when we are forced to put down our phones and look out at the world around us. When shown together, I hope my paintings will demonstrate a “before and after” type of effect. My paintings expose the dichotomy between the virtual and the real and how that affects our social skills and ability to be present in the moment, because what importance does one’s presence really have if their attention is somewhere else? More often than not, our attention lies in a world that does not exist in the physical present. With my paintings I engage viewers emotionally through the lack of a real space and the allusion to a virtual, nonexistent one. My paintings are all oil on canvas and feature realistic figures situated in a stark white background. I omit the background in order to monumentalize a private, trivial moment, bringing attention to an important contemporary social problem: the de-personalization of conversation, communication, and interaction. In comparison to that, my new series "Observance" is similar in style, but the subjects aren't looking down. The subject looks out to what is in front of them. What inspires a new painting? Most of my paintings are inspired by the people around me in everyday life. My work focuses on conceptual portraiture, stemming from an interest in people, psychology, and the way we interact and communicate. My paintings explore human connection and social interactions based on our relationship to our surroundings and one another. 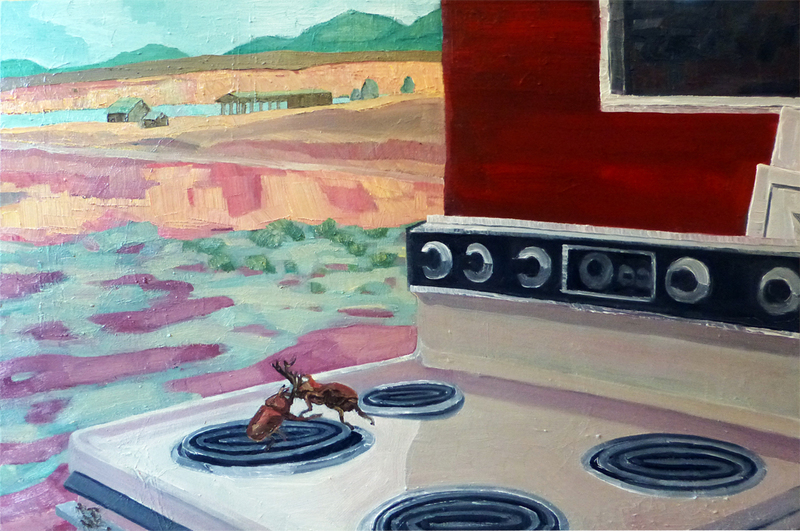 My most recent paintings were inspired by a residency called the Land Art Road Trip. I spent a full month traveling and camping to see iconic land art and landscapes of the American Southwest. Living on the road and in extremely desolate landscapes with an intimate group of people for one month was a jarring change from my chaotic life in New York City. With no cell reception for weeks at a time, this journey created an opportunity to slow down and reflect on the interactions between the people, places, and communities that I encountered. This inspired me to create a series of paintings that aim to capture the sensations of awe and wonder we feel when confronted with nature’s surreal landscapes, as well as our everyday surroundings. You are based in the North East, do you see yourself living/working somewhere else in the future? I’ve lived in the North East my whole life and have always envisioned staying here. I wouldn’t mind exploring and living somewhere else for a few years though. I’m always open to change. California definitely wouldn’t be a hard place to live. I could definitely spend some time in San Francisco. I have recently embarked on a new chapter in my work that I am very excited about, though I don’t have many photos of it yet because I’m still deeply engulfed in the process. For the past six years I have been exploring narrative through collage focusing on paper quilt and encaustic collage techniques. The collages combined some original photography but mostly were combinations of found ephemera. My new work focuses strongly on a series of self-portraits fused with encaustic that I am carving into with line and text. In addition to this work being exciting because it is a new format for me, the entire process is completely different primarily because it is much slower. There are many steps to create each piece, and there are steps between steps, and the experience of slowing down my art making practice is revealing the benefit of giving me more contemplative time. The process is almost meditative in its pace, which I think is exactly what I need. I’ve been working with encaustic since 2006 and have always enjoyed experimenting with it and seeing how I could combine different types of contemporary media types into the ancient medium. Since my background is in photography, I have been drawn to incorporating photographic images into my work throughout. For the past several years transferring images on top of encaustic medium has held my interest, but with this new work I am transferring the image to the canvas first, and then painting over it with many layers of un-pigmented medium. My reasons are largely conceptual surrounding my visage sealed/preserved and also buried/smothered in/by wax. The idea for carving into the encaustic also has multi-dimensional meaning for me. On the one hand it is a way to incorporate text into the work, and from a different point of view it can be seen as branding the body in any number of ways. Because the photographs are self-portraits and the un-pigmented encaustic has a similar tone and texture to fair skin like mine, the surface can be seen as flesh and even the non-figurative section of the canvas as an extension of the figure. I noted from your Twitter account, you have been teaching — is teaching your method a form of inspiration with your own work? For the first time in years I am teaching an art class, a mixed-media collage class at The Eliot School in the Jamaica Plain Neighborhood of Boston (http://www.eliotschool.org/classes/collage), and it has been thoroughly energizing. I’ve been introducing the students to a range of collage and image transferring techniques and providing them with independent work time to explore materials and methods. I’ve been encouraging them to challenge themselves in thematic and compositional directions and it’s been thrilling to see their creativity blossom. The third 10-week session is starting soon and more than anything I realize how much I have missed working with art students. So much so, that I am developing a few smaller workshops to hold at my studio later this spring. What is your best advice to someone starting out as an independent artist? If you really want to do it, you can find ways to make it happen. Artists are inherently creative and so should think outside of the box when it comes to earning an income and capitalizing on a creative skill set. It’s a funny business to be in because unlike most other fields earning advanced degrees doesn’t necessarily correspond to a higher salary, and many people will say things like “Give it up and get a real job.”, and one could spend hours at work and not have anything intrinsic to show for it. Being an artist is something that one forever has to justify, but it is some the most personally fulfilling work that one can ever do. You live in the Boston area where snow has created a city within the city, are you ready for Spring? I am more ready for spring than I have ever been! In fact, it’s about 40 degrees here today and I’ve been driving with the windows open and I am only wearing the lighted jacket. After three consecutive blizzards any temperature above 30 is cause for celebration! My residency took place at The Baer Art Center, a very small visual art program located in northern Iceland, The area is remote, about 5 hours north of Reykjavik by car. The closest town is Hofsos, a small fishing village with a population of about 150. I was awarded one of only 10 residency spots given each year at Baer to artists from around the world—five for the month of June, and five for July of each calendar year. So, I was among four other artists from different parts of the world, for about 29 days total. The other artists hailed from Denmark, Germany, Japan and Seattle. It is an extremely small program, and as a result very competitive. The only residency requirement was to create work. Each artist was supplied with a well-lit private studio space and an attached private sleeping residence, and fed all meals (which were wonderful: a combination of traditional Icelandic cuisine and comfort foods, all created by an in-house chef!) Additionally, regularly-planned excursions to different locations/destinations/sites of interest were offered, most of which were hosted by the Baer Art Center director, Steinunn Jonsdottir. On the final full day of the month-long residency, we five artists hung a show of work created during the month, and the one-evening event was well-attended by over 200 local residents (many of whom came a far distance to see the exhibit). I began my journey by spending a few days in Reykjavik, just prior to traveling to Baer. Once at Baer, I remained in that area until the end of the month, when I returned to Reykjavik and flew home to Boston. Iceland holds a beautiful, but stark, landscape. Very few trees. Muted colors, rocky soil, and majestic mountains that start at your feet. Glaciers populate the country in specific spots, but also lush green farmland is a norm during the warmer months. In June, the temp averages about 50 F, and the sun never fully sets. As a result, I probably slept about 3 hours per night...yet never felt truly fatigued (that is, until I arrived home, when my body clock saw night and I slept for four days straight). All of the artist residents would find themselves working at odd hours, our minds thinking it was sometime in the afternoon....even at 2am. It was a bit surreal, and wonderfully new. The Art Center is located on a large working horse farm. The ocean borders the farm on one side, mountains on the other. We faced Greenland to the north. Two-thirds of the Icelandic population of 320,000 live in and around Reykjavik, so the area where we were seemed to have more horses and sheep than people. The people: a bit quiet and reserved at first, but authentically warm when approached. One of the friendliest places I've ever visited. Most everyone speaks English. Wonderful contemporary culture- visually, musically. I spent my days much like this: wake up sometime around 7, step into the studio to work after grabbing coffee and breakfast from the lounge area at the end of the building, then break around 12:30 and walk over to the main house for a communal dinner meal. After the meal, back to my studio for more work, and a long walk or hike somewhere in the area to break up the studio time (sometimes these would last the remainder of the day). More studio, a light communal dinner around 7pm, some laptop time, maybe more studio...then realizing it is 3 am and time for bed. Then, up again at 7am and repeat. On excursion days, we might be out for the entire day visiting other towns or places of interest, or just part of the day...it varied. We were a small enough group that we all could make improvised plans as we went. Steinunn, one of the kindest and most generous people I have ever met (particularly in the art world) was always so accommodating and helpful. As you can imagine, we became like a small family. My work took two roads, as it always seems to do: landscape and abstracts. The landscapes reflect the minimalism of the country- sparse, simple and direct- while the abstracts seemed to respond by wanting to be layered. The body of work still continues in my studio. My biggest visual take-away from the trip: the whiteness of the light in Iceland. So north that the light seems cooler, whiter. Colors looked a bit different. It's a theme in this body of work...both landscape and abstract. The light back here at home is a harsh yellow by comparison. Most recently, a monotype of an urban landscape and a new etching “Winter Wonder Wheel” which I worked on over the winter, after a visit to Coney Island. I was born in London, UK and immigrated in 1962 to the US. I lived in Southern California for 12 yrs before moving to New York. I moved to Brooklyn in 2010 to be close to grandchildren and to live in the city. With so much diverse New York architecture to pull from, how do you pinpoint your themes? I am attracted to an image basically for the composition and the interplay of lights and darks which work well in the etching techniques of line,aquatint and soft ground. For the monotypes I use oil paint on a zinc plate from which I print one image. I used to do only etchings, but some years ago I started doing monotypes as well: painting with oil paint directly onto an unetched plate and pulling only one print. With etchings I print editions, usually of 50. I enjoy working on both etchings and monotypes. With my etchings I have an image in mind but it is through the printmaking process that I discover the final print. I’m taking a journey from initial idea to final print. 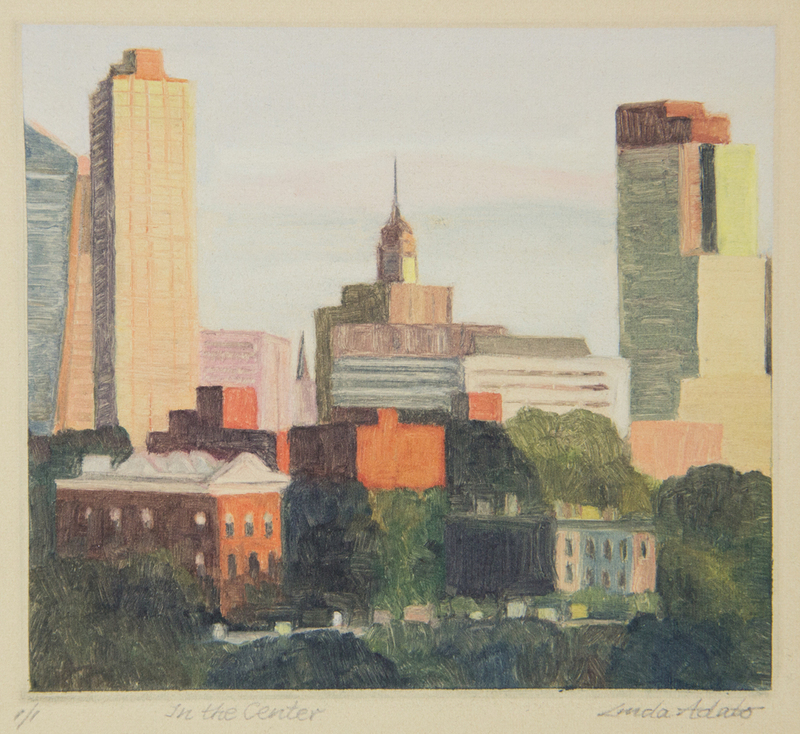 The monotypes are more spontaneous, but I look for the same structure and composition.